Our Round Robin topic this month is: What writing practices do you have that you think are eccentric or at least never mentioned, but you find helpful. Somehow, I doubt there is anything any writer does that no other writers have ever tried. Just think of all the thousands, nay millions of authors . . . However, there is one thing I always do that is never really mentioned in any workshops I’ve ever been to so that’s what I’m going to talk about. I’ve been given several character outlines, interview sheets, Goal, Motivation & Conflict charts, and other ways to capture your characters’ personalities, quirks, physical appearance, family and friends, job/career etc. And over the years I’ve boiled what for me is the best of these down to one single page sheet that I can keep handy while I write. But the other thing I do that no one ever talks about is actually writing the main character’s complete history. It’s mostly backstory and most of it will never show up in the current work, but it helps me to know my character as well as I know myself, or my siblings and best friends. It’s especially important for me because I am not a plotter. I’ve tried all those methods, too. I’ve used story boards, plotting notebooks, outlines and more. But the harder I try to get my story off the ground with plotting, the more I find myself mired in mud and at a dead stop. I am a pantser. My stories are character driven. That idea quickly blossomed into a story where my heroine did just that and woke up in 1775, just before the start of the Revolutionary War. Just as quickly as I envisioned how the book began, the ending came to me like a Technicolor movie in my head. But what came between that unexpected beginning and the end? Part of that plot would be influenced by the beginnings of our country’s fight for independence, but what fueled the story were the reactions of my characters to both the historical events and each other. But how did I know how they might react? Because, by the time I finished writing their backstory I knew them very well and I didn’t even have to think about how they would react. They just did. When I write a romance, I write the detailed backstory for both my hero and heroine. For my mainstream novel, THE CANDIDATE, I wrote the detailed backstory for Matt Steele, and slightly briefer ones for Thann and Annie who were also point of view characters in the book. When I sit down to write these histories, I already know some details, names, dates of birth, place they were born and live, parents and friends etc. But then I just sit down and start typing. I don’t worry about grammar, spelling, repetitive or run on sentences, I just type. No one’s ever going to see these but me, so perfection isn’t important. I tell the story from the day they were born or if relevant, how they came to be born, including details of their early childhood, teenage years, college years etc. I tell it as if I was telling someone about a real person, sometimes backtracking to include a detail I didn’t think of before, but that suddenly becomes important as I’m telling their story. For Matt Steele, it was important that his birth father was killed in WWII and Matt never knew him, so I included those details. I included his personality and his best friend in high school who remained his best friend until he was killed in Vietnam. I talked about Matt’s coming home from war and going back to school to get his law degree, how he got drawn into politics in his early years, and how that led to his becoming a candidate for president. It included his courtship of his wife and his becoming a father and his current relationship with his kids, his mother, his stepfather and others. This history was 7 pages, single-spaced and never edited. But by the time I was done, I knew Matt as well as I know my brother. When something happened in the story, I knew exactly how Matt would react. I knew what choices he would make, who he would rely on, what he might keep secret. For the historical time travel mentioned earlier, I knew that Iain was not optimistic about the chances the colonists had against the British because I knew his father had died after the debacle of Culloden, and Iain knew well the strength of the English army and their ruthlessness in quelling insurrection, but I also knew that Iain was inspired by his father’s example to stand for what he believed was right. So, as the war for independence began, I knew what Iain would choose to do and how he would feel about it. In one of the books in my Camerons of Tide’s Way series, my heroine is a rescuer. She brings home puppies that have been abandoned, a duck that got its feathers matted with oil, lost people and anyone else in distress. So, it stands to reason that when she comes upon an ex-soldier being harassed by a war protester, she springs to the soldier’s defense. It’s equally understandable that she brings a fellow student home to sleep on her couch when his apartment catches on fire. And, because I know my hero fought in Vietnam and came home scared by that war, I don’t have to wonder how he’s going to react to finding an unknown Vietnamese man sitting in his living room inspecting the souvenir pistol that Cam brought home from the war. I could even feel the adrenaline flow as his internal alarm system went into high alert. Because I have a clear picture of how and where the story is going to end, along with the inciting incident that started it, knowing my characters like siblings lets me continue to write by the seat of my pants. Which I find more exciting anyway since the events unfolding are as new and fresh to me as they will be to my readers. I guess it shouldn’t be a surprise that these characters live on in my head long after their stories are told. As I type the end, when their adventure is over, I always feel a huge let down, like one of my best friends just moved to the west coast or something. But perhaps being that close to them is what makes them come alive for my readers. I’ve been told by more than one reader that she feels like she should invite the Cameron’s over for supper or that they wished they lived in Tide’s Way. And I guess that’s a good thing. If you’re a writer looking for other tricks of the trade, or if you’re a reader just curious about how we writer our stories, check out the other authors on this blog hop. The first time I read Sprye’s book Heidi, I was 8 years old, and I was so into that story I could close my eyes and be on that mountain living with the grandfather. Long before the movie came out, I imagined myself climbing up the mountain every day with Peter, listening to the goats baaing and their bells jingling. I felt Peter’s angst when the little goat fell onto a ledge and he had to be saved. I was there. Living the life of Heidi even though I’d never been out of the US. Later I curled up with the Nancy Drew mysteries and I was the sleuth. I paid close attention to all the little details, and I so wanted to solve that mystery before Nancy figured it out. Reading was a ticket out of where I lived and into somewhere else. Somewhere more exciting. In my teens I came upon a trilogy set on a remote island off the coast of Maine. To begin with, I had a thing for islands and I loved the ocean. But even more, the heroine was a young woman very like me, smart, stubborn, impulsive and ready to throw my heart into anything that caught my fancy. And because I was so like Joanna, I felt like I was there, living her life, falling in love with the exciting stranger, even when I felt sorry for the steady young man who’d loved her since she was a girl. Years later, when I read the author’s autobiography, I discovered that island really existed, and I talked my dad into sailing out there one summer to see it in person. 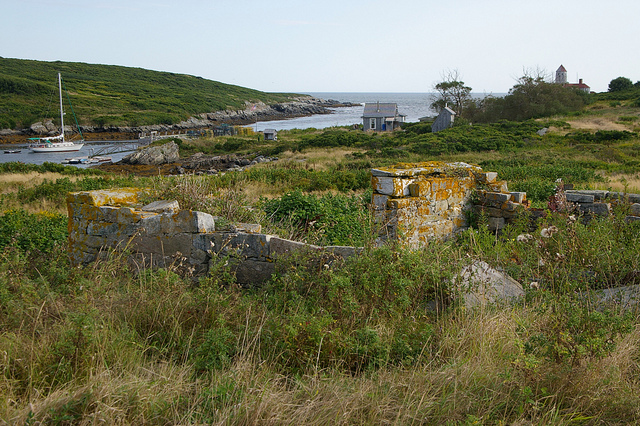 Most of the full time residents had moved ashore long before, but the buildings still stood. We crept cautiously through the old clubhouse where Joanna had learned to dance and hiked down to the eastern end where her brother lived after he married. It was just as I’d imagined it years before when I read the books. Reading can be an adventure through time, too. Recently Starz brought Dianna Gabaldon’s Outlander to the screen, but more than twenty years ago, I traveled back through those stones with Claire and fell in love with Jamie Fraser. I rode horses and visited castles. I roughed it with a band of Scottish border rascals and loved every minute. In the end, I ached for the lost identity of Scotland when the triumphant British crushed the clans at Culloden. Even though I’d known that bit of history before I read the books, Gabaldon made it come alive for me in a whole new way. I’ve never been to Edisto Island in South Carolina, but C. Hope Clark made it come alive for me, from the tang of salt in the air, to the rush of waves on the beach, to the close-knit community. I’d like to go there for real some day, but in the meantime, her heroine, Callie Jean Morgan, shares her world with me, getting to the bottom of mysteries and debunking tales of a jinx. I’ve seen Sanibel Island through the eyes of Doc Ford, and experienced the nail biting tension of the fight against terrorism and international espionage with Jack Ryan Jr and Mitch Rapp, thanks to authors like Randy Wayne Wright, Tom Clancy and Vince Flynn. Non-fiction can transport us just as magically to another time or place. You can go on safari in Africa, take a boat up the Amazon River, hike the Appalachian Trail, snorkel over the Great Barrier Reef in Australia, or visit another era. Sometimes you get to live those adventures first hand, but there just isn’t enough time to do it all in one person’s life. But you can enjoy all these adventures and more in a book. Not too long ago, my heart and soul were in the belly of a military helicopter and I was holding my breath while a brave female medic went down on a cable to save a wounded soldier and the pilot kept a steady hand on the controls in spite of weather, inhospitable terrain and enemy fire. Eric Sabiston was that pilot and he wrote about his real life experiences in Afghanistan in Dustoff 7-3. Every once in awhile I read alarming statistics that discuss the declining number of adults who read for pleasure in today’s world. I feel sorry for those who’ve never found the excitement and joy of reading for fun. You don’t have to be wealthy. Anyone with a library card can find endless adventures, both imaginary and real to take them away from their world to another. The advent of e-readers makes it even easier to take your adventures with you wherever you might go. I always travel light, but tucked into a pocket, or my backpack is my Kindle with dozens of books, some fiction, some non-fiction. A little romance, a little suspense. Even my smart phone has the Kindle app on it, and I can escape into whatever adventure I’m on at the moment while waiting at the doctor’s office, in a traffic jam, in a long line at the grocery store, or sitting in the park. If you haven’t read a book since you got out of school, I encourage you to give it a try. The adventure is there – you just have to reach out and grab hold. When I was young and thought I was all grown up, a man named Harvey Hopkins, who was probably wiser then than I ever will be, told me that the day we stop learning and growing is the day we start dying. I was in my late twenties at the time. I’d fallen in love and married in haste, had three kids and been abandoned to bring them up on my own. My attitude was, “been there, done that” and what else is there to learn? Well, raising three kids, eventually four, corrected that misguided idea. Among other things, I learned that raising a son has challenges you don’t anticipate for the simple reason that you are a woman and girls don’t think the way boys do. It was easier to guide my daughters to adulthood, sharing of my own hard learned lessons. Understanding my son took some serious thinking “Outside the box.” Kids don’t come with manuals regardless of gender. Every stage of their growing years brings new challenges. And guess what? My children are all adults now with children of their own and I’m still learning new things about parenting. That the job isn't over when they reach adulthood. Their triumphs will always be your pride, their joy will always bring you happiness and their pain will always be the hardest thing you'll ever have to bear. I also learned that I’m strong and I’m a survivor. I made mistakes and grew wiser. I weathered the storms life threw at me and grew stronger. I learned I’m not always right and it’s smart to listen to other points of view. I learned how to say I’m sorry and admit to my mistakes. I learned that my faith is not just something that happens on Sunday, but lives with me every moment of every day. And I learned to enjoy every moment, because all too quickly, those moments will pass. A few things I’d like to add to Harvey’s advice: One is a quote from George Bernard Shaw, “We don’t stop playing because we get old, we get old because we stop playing.” So get out there and play. Live and learn every day. If you don’t already have one, make a bucket list. Put everything you ever thought of doing on it. Even the things that don’t seem possible. It’s good to have dreams, and it’s good to dream big. Travel while you can. See things that fill you with wonder. Make new friends wherever you go, help others whenever you can – the more you give of yourself the more there is to give. Be optimistic. Be a Pollyanna. Keep your mind and your heart open and never stop growing.